Communities living alongside the world's tropical forests can estimate an area's carbon stocks as effectively as hi-tech systems, a study has shown. An international team of researchers found communities using sticks and ropes obtained the same results as data gathered by satellites. 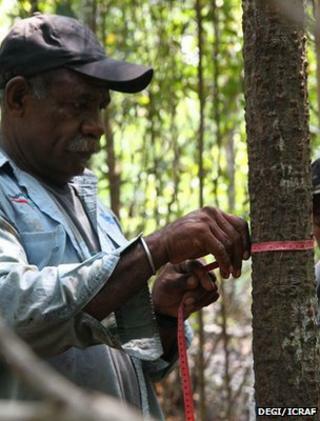 They added that the study showed that projects aimed at halting deforestation needed to use these people's skills. The findings have been published in the journal Ecology and Society. "For the first time, we have shown that local communities are able to monitor forest biomass up to the highest standards of the [Intergovernmental Panel on Climate Change], even in the most species-rich forests on Earth," explained co-author Finn Danielsen, senior ecologist for Denmark-based NGO Nordic Foundation for Development and Ecology. "We are arguing that the (Redd) policy document is showing that they should be part of the process, but in reality they are not." Reducing Emissions from Deforestation and forest Degradation (Redd) projects are one of the main mechanisms available to policymakers to curb greenhouse gas (GHG) emissions from deforestation and land-use change. Current estimates suggest that deforestation and forest degradation accounts for about 15% of GHG emissions resulting from human activity. Under the schemes, such as the UN's Redd programme, developing nations are paid not to fell large areas of tropical forests. Redd+ projects also include other measures, such as conservation, sustainable forest management and the enhancement of forest carbon stocks. "If you want to have an impact on the ground, you have to involve the people who live in the area who depend on the resources provided by the forests," Mr Danielsen told BBC News. "You can do all sorts of remote sensing and national inventories of carbon stocks but if you do not involve local community members, you are going to have a very hard task linking all the factors together to have real implementation on the ground." With this in mind, the study - co-ordinated by the World Agroforestry Centre - identified 289 plots in nine forest types located in four countries in South-East Asia and compared the carbon stock estimates collected by local communities with the results gathered by professional foresters. Mr Danielsen observed: "We found that they obtained the same results, both in terms of accuracy and precision." He explained that the method used by the local communities was "very easy and very straightforward", using just basic instruments, including sticks and ropes. "They establish a plot in the forest that contains a typical composite of trees for the forest," he said. "Then they measure the trees and write down on a piece of paper how big the trees are and how many there are. "They then enter this data into a spreadsheet and then this spreadsheet can tell us how much carbon is stored in that particular plot. "If that plot is representative of the area then you can calculate how much carbon is stored in the forest." The team hoped its findings would show that forest communities were an under-used resource when it came to the monitoring aspects of Redd projects. "At the international level, we are saying that we have got to find ways for Redd to be having a true impact on the forests around the world," Mr Danielsen commented. "At a national level, we would like to send the message to government departments that it is possible for local communities to do the job. "We are not saying that they can do it better or they should do it alone, we are just saying that they can do it just as well as government foresters and foresters from the private sector." The study's publication coincides with the start of the Redd Exchange 2013 in Oslo, Norway. Organisers say the two-day gathering of 400 experts in the Norwegian capital city aims to renew the forests and climate change agenda in light of the experience of Redd projects to date.